Part IX: 2018 Annual (1879-1895) features contributions by: Deanna Baran, Roger Riccard, David Marcum, Tracy Revels, S.R. Bennett, Nick Cardillo, Robert Stapleton, Kevin Thornton, Leslie Charteris and Denis Green, Shane Simmons, James Moffett, C.H. 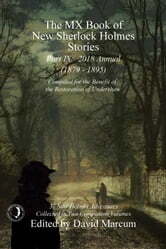 Dye, Stephan Gaspar, Marcia Wilson, Sonia Featherstone, Geri Schear, David Friend, Mark Mower, and a poem by Amy Thomas… and Forewords in both volumes by Nicholas Meyer, Roger Johnson, and David Marcum.Once again, the adventures of Sherlock Holmes and Dr. Watson continue in this acclaimed anthology series, with thirty-seven new tales presented in two companion volumes more Holmes than could fit into one book!In 2015, The MX Book of New Sherlock Holmes Stories was first published, a huge three-book set featuring over sixty new traditional Holmes exploits, all set within the correct time period. Soon, the demand for even more traditional Holmes adventures led to further volumes. The next year brought Part IV: 2016 Annual, and then Part V: Christmas Adventures. In spring 2017 there was Part VI: 2017 Annual, and that fall revealed the massive two-volume set, Parts VII and VIII: Eliminate the Impossible. 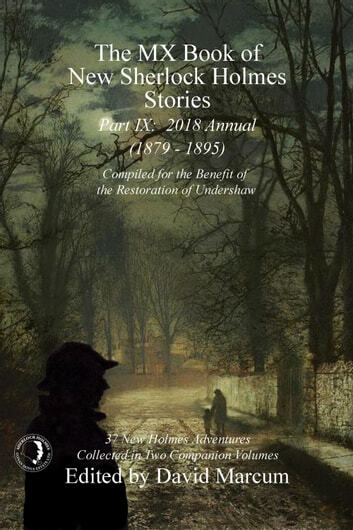 Now we present another two simultaneous volumes, Parts IX and X: 2018 Annual (1879-1895) and (1896-1916).There can be no argument that Sherlock Holmes is one of the most famous and recognizable figures in the world. There were only sixty narratives brought to us by the original Literary Agent, Sir Arthur Conan Doyle. Clearly that is not enough. Watson once wrote that he kept his unpublished cases in his old Tin Dispatch Box. Now, with the publication of these latest volumes, that box has again been explored by some of today’s best Sherlockian writers, all of whom are donating their royalties from these anthologies toward the restoration of Undershaw, one of Sir Arthur Conan Doyle’s houses, and the location where The Hound of the Baskervilles and many later Holmes stories were completed.Climb the seventeen steps to the sitting room at 221b Baker Street. Sherlock Holmes and Doctor Watson are waiting...The game is afoot! The West End Horror: A Posthumous Memoir of John H. Watson, M.D.